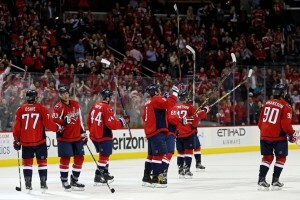 Led by a three-goal third period, The Washington Capitals beat the Columbus Blue Jackets 4-1 and officially clinching the 2015-16 President’s trophy and assured home-ice advantage throughout the Stanley Cup playoffs. With a couple of rebound goals, a late power play strike, and solid goal-tending, the Caps (54-16-5, 113) wrapped up the final regular-season prize of the Presidents trophy for most points in the regular season — and still have seven games to play. Coming into this game, the Blues had dominated with three shut-out wins, this one makes four as the Caps fall 4-0 to the Blues. The St. Louis Blues (44-22-9) are fighting hard for home ice positioning in the west, while the Washington Capitals (53-15-5) are one point away from the President’s trophy. The Blues just wanted this one more. The Blues played as the Caps did in December, four small breakdowns and four opportunities taken advantage of. The Blues’ first goal came as Dimitri Orlov gave up a soft turnover in the offensive zone, allowing the Blues’ Kyle Brodziak a quick snipe on an unprepared Philipp Grubauer. Less than 72 hours after Brooks Laich was shipped off to Toronto, the hometown fans at Verizon Center on Wednesday night warmly welcomed their adopted hometown son back with open arms, cheering during his first-period tribute video that aired on the jumbotron and even when his name was briefly on the big screen as part of the Maple Leafs’ starting lineup. On the ice, however, Laich’s return to the nation’s capital was one of decidedly less positivity for his new team. 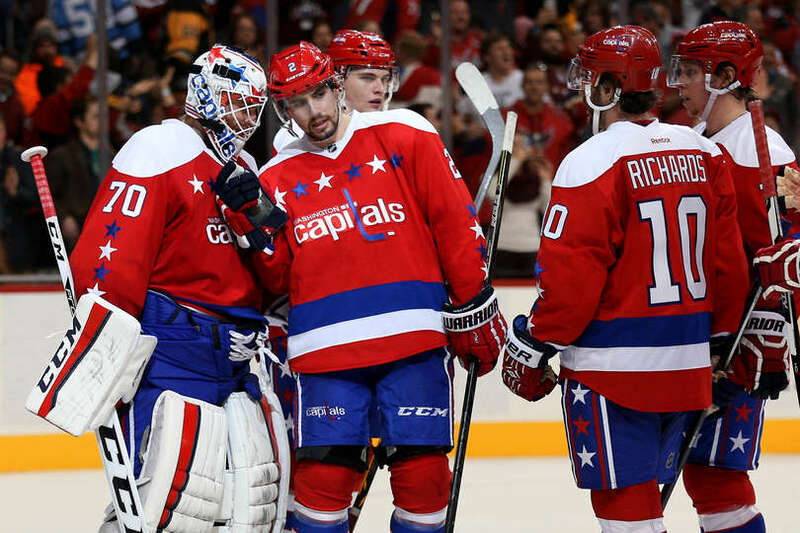 Two quick goals from the Capitals in the first paved the way for a 3-2 Washington win, in spite of a lackluster overall performance for a lot of the contest from the hosts’ standpoint. Stop me if you’ve heard this one. The Washington Capitals came out slow, got their stuff together, came roaring back, and beat a quality opponent with a late to goal to keep their season record above record-setting pace. 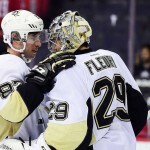 Tuesday, Matt Niskanen (or was it T.J. Oshie?) was the player that scored the late goal, and it was the dreaded Pittsburgh Penguins that suffered the come-from-ahead loss to these never-say-die Caps, as Washington escaped with a 3-2 win before an enthralled Verizon Center crowd. Oshie seemed to have gotten a piece of Niskanen’s slap shot from center point, which came with 6:22 to go, but as of late Tuesday the goal was awarded to the defenseman, his fourth of the year. Trailing Philadelphia 1-0 and getting beaten to most loose pucks, the Washington Capitals fought to kill a two-man disadvantage which threatened to break the game open. When Braden Holtby robbed Mark Streit for perhaps the game’s most critical save, and Washington killed both penalties, the momentum shifted. From there, the Capitals scored three of the game’s next four goals and beat the Flyers 3-2 at Verizon Center on Sunday. Outplayed for much of the game, it wasn’t until around the midway point of the second – specifically, Holtby’s robbery of Streit at the 12:31 mark – that the Capitals began to commandeer the pace of the game. “To me, that changed the whole, they could have been [up] 2 or 3-0, and I don’t think we would have came back from that deficit. Those are important moments for us,” Capitals Coach Barry Trotz said. With 4:04 left until the second intermission, Alex Ovechkin deflected Karl Alzner’s attempt past Flyer goalie Steve Mason to tie it. In the process, Ovechkin moved into third place in terms of NHL players who started their career with consecutive 30-goal seasons at 11, behind Wayne Gretzky (13) and former Capital Mike Gartner (15). 1:09 later, Dmitry Orlov took a feed from Andre Burakovsky in front of the blue line, skated through two Flyers, and rifled the puck past Mason, his fifth goal of the year giving Washington their first lead. 51 seconds into the third, Nick Schultz tied the game with his first NHL goal. Just over five minutes into the frame, Matt Niskanen gained control the puck in the Capitals’ zone on the goal-line extended. Gliding through the neutral zone, Niskanen deked through a few Philadelphia defenders before delivering a snap shot past Mason, eliciting “ooh”s and “ahh”s from the crowd. Trotz, when asked what the bench reaction to the spectacular goal was, described the general response as “Holy … it’s a Sunday, I can’t say it. That’s really what I’m thinking, that’s pretty well what a lot of guys on the bench were thing. Through the comeback and all, Trotz acknowledged that the team is beginning to get back into its groove after two long lulls which bookended the All-Star break. That said, he knows that it’s time for his group to step up. “One of the things that I think that we have to recognize is that everybody’s kicked their game to playoff mode. The Islanders, the Flyers … we’re going to Nashville, they’re gonna be in playoff mode. Fortunately, with our record, we have some separation,” he said. “At the same time, we can’t take that for granted. That’s when we don’t play well, that’s when you get hurt, that’s when you get frustrated. What we try to talk to the group about is, ‘Let’s use everybody’s level of play and let them help us raise our play.’ Because we need to be in playoff mode. Mark Scheifele scored with 19.9 seconds left in overtime — but not before an almost interminable review of a potential offsides play — and the Winnipeg Jets ended the Washington Capitals six-game winning streak 2-1 at the MTS Center in Winnipeg. Caps head coach Barry Trotz asked for the review, hoping that Jacob Trouba would be ruled offsides before receiving an entry pass from Blake Wheeler as time was winding down. But after several minutes of the referees huddled around a tablet computer at the scorer’s desk, the play was ruled inconclusive and allowed to stand. 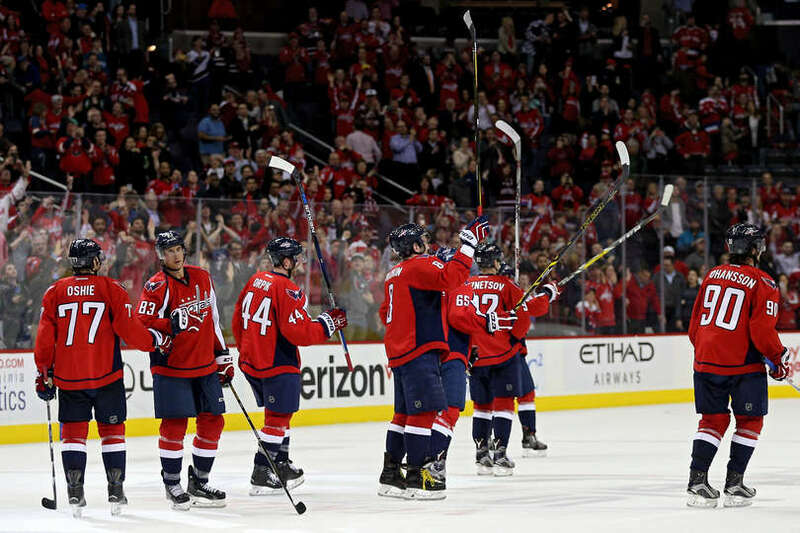 It was Matt Niskanen, Justin Williams and Evgeny Kuznetsov who stole the show on a night that saw Alex Ovechkin and Nicklas Backstrom reunited on the same line for the first time this season. 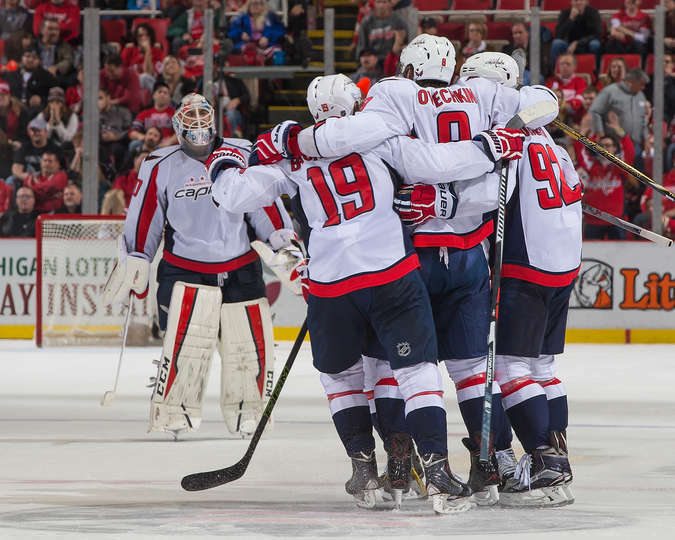 Williams’ goal in regulation — and Kuzntesov’s in overtime — led the Washington Capitals to a 2-1 win over the Detroit Red Wings at Joe Louis Arena. After four days off, the Caps (12-4-1) struggled to shake off the rust against the same Detroit team (9-9-1) that shut them out on 38 shots eight days ago. Hero of the night Kuznetsov made his mark in overtime. While the Red Wings were stuck in a line change Kuznetsov beat Mzarek to the far side and slipped one into the goal less than a minute into 3-on-3. Although the Caps managed to put up 10 shots (eight on the power play) in the first frame, their passes and shots frequently sailed wide of target. And in what has become a bothersome sight in recent contests, shaky neutral zone play allowed their opponent, in this case Dylan Larkin, to exploit a one-on-one matchup down the boards and then beat Braden Holtby high far-side. 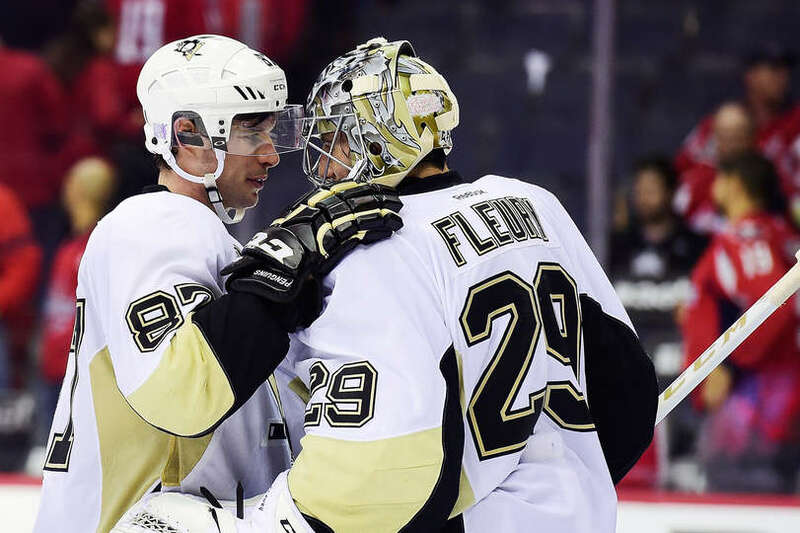 After a western Canadian trip that saw a powerhouse of offense, the Washington Capitals failed to topple Marc Andre Fleury and fell to the Pittsburgh Penguins 3-1. Although the first period did not start with a barrage of shots and goals as the previous few games have, the Caps proved they are no one-trick pony with their defense and Braden Holtby showing up tough. After a thumping from the San Jose Sharks on Tuesday, the Washington Capitals came out flying Thursday night for a red, white, and blue 4-1 win over the Chicago Blackhawks. Good ol’ American boys John Carlson, T.J. Oshie and Matt Niskanen put up a combined five points on the night. Beaten badly by a New Jersey forward just moments earlier, Alex Ovechkin retrieved the puck deep in the Washington zone, and quickly entered New Jersey territory. On the first night of his second decade in the National Hockey League, Ovechkin added to his already-legendary highlight reel with a marker that sent the sellout crowd at Verizon Center into delirium.